Benjamin Moore UK is delighted to announce the addition of these new products to our range. 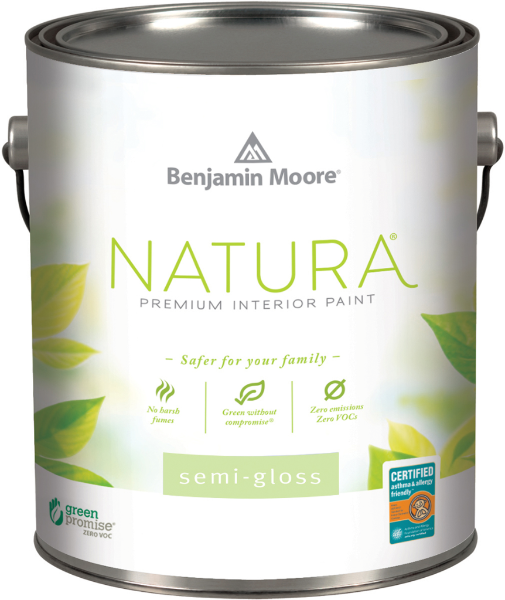 Natura Semi-Gloss is a zero emissions* trim paint that is safer for you and less harmful to the environment. It complements the Natura Flat product to offer a complete solution for emission and odour free room transformations. Benjamin Moore goes the extra mile with Natura, stripping out the residual VOC's* to achieve the lowest possible level. In fact, in the stringent California Department of Public Health emissions test, no emissions are detected at all. * This enables the Natura line to be certified asthma and allergy friendly by the AAFA and to achieve the coveted Cradle to Cradle Certified mark from the Cradle to Cradle Products Innovation Institute. 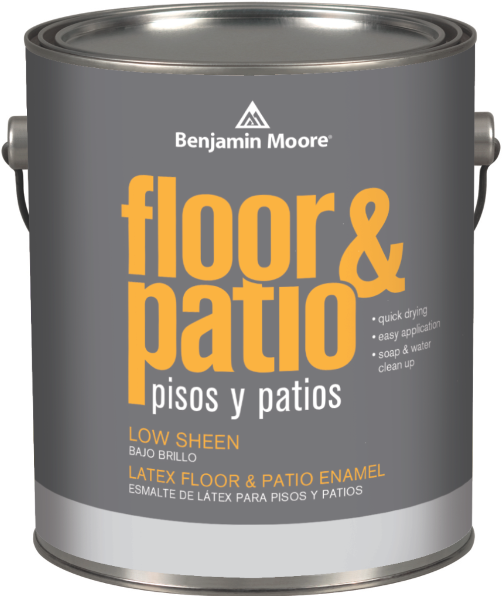 Floor and Patio Enamel is a super-durable, quick-drying epoxy-modified acrylic paint suitable for interior and exterior wooden, concrete or stone floors. Floor and Patio Enamel is resistant to scuffing, marring and chemicals such as soap, detergents, grease and oil. Being water-based, it is easy to apply and is low odour and low VOC*. 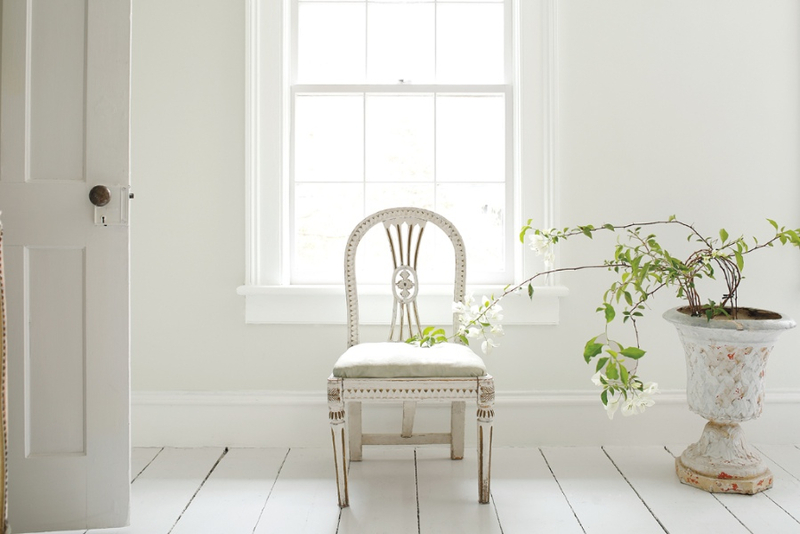 It is available in all 3,500 Benjamin Moore colours so you can create a stunning scheme from floor to ceiling. 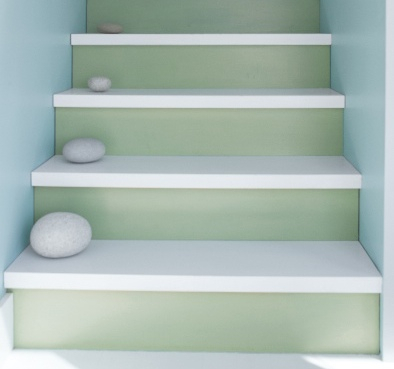 Walls 'breath of fresh air 806' Natura Flat, Stairs ' van alen green HC 120' and 'super white PM-1' Floor and Patio Low Sheen. * VOC stands for Volatile Organic Content and is measured in Benjamin Moore products according to the United States Environment Protection Agency Method 24. Click here for more information. The Cradle to Cradle Certified designation is given to products that meet stringent requirements of the Cradle to Cradle CertifiedTM Products Program. Find out more at www.c2ccertified.org. The asthma & allergy friendlyTM Certification Program independently tests and identities consumer products that are more suitable for those living with asthma and allergies. For more information about the asthma & allergy friendly Certification Program, please visit www.aafa.org/certified.